I look forward to watching this movie since the first trailer released last year. With such a heavy-lifting casts including Vin Diesel, Paul Walker, Jordana Brewster, Tyrese Gibson and Dwayne “The Rock” Johnson make this movie a must-see for me. Even Eva Mandes made a cameo in this film. 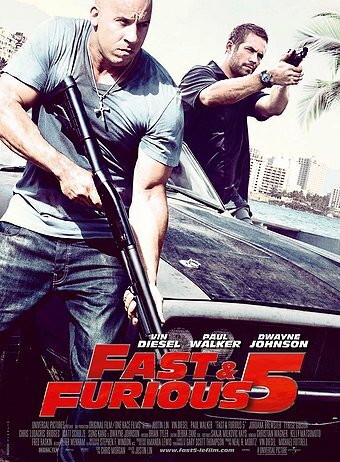 The record breaking box office for the Fast & Furious put an acceleration for the fifth installment for the series. What a great opening for summer blockbuster. $83.6M opening weekend! Make sure you stay until the end of the credit. There’s a opening act for Fast & Furious 6 (maybe?). Don’t expect of a great plot or story out of this film or you will be disappointed. Hobbs (The Rock) lead an elite team to capture Dom and Brian. Hobbs character is very interesting, a good commander and funny with dark jokes. I wonder if there will be a spin-off of his character. Dom and Brian assembled the team one last time to pull one last job on the Brazilian corrupted businessman so they can have enough money to disappear. The first half of the movie was a bit boring while they were trying to set the plan up for the heist. With both white and black worlds coming at them, they decided to go through with their plan. The driving through Rrio de Janeiro streets with the vault behind the cars scene was impressive with limited CGI help.